FORT WORTH, Tex. (June 11, 2005) - After over a year of heartbreak and bad luck, Tomas Scheckter finally got the monkey off his back and broke through for his first victory with Panther Racing. Scheckter scored a dominant victory Saturday night in the Bombardier Learjet 500k at Texas Motor Speedway. Scheckter, who has been winless since his rookie season, ended one of the most storied runs of bad luck and misfortune by edging out former Panther driver Sam Hornish, Jr. at the finish line by 0.0534 seconds. "It's been tough before this victory tonight," Scheckter admitted. "You honestly start to have doubts about your ability to win races, but this win is unbelievable for our team. Having Sam (Hornish) behind us really made us nervous at the end because he's won so many close races." The victory was the 10th-closest in the history of the Indy Racing League. The win is Panther's 15th career victory, and the team regains its title as winningest team in IndyCar Series history. In addition, it was the team's fifth at Texas Motor Speedway, making them the winningest team at the 1.5-mile oval. This is Scheckter's first victory since 2002 at Michigan International Speedway, when he was with Cheever Racing. "To do this for Chevrolet is huge, and we're also in Pennzoil's backyard, so it's a major win for everybody," Tomas said after his win. "This is just what we needed, what the team did during this run and the way everybody stuck behind me was great. I told the guys as long as they got me out in the Top Five during the race I'll win, and that's just what they did." Scheckter dominated the contest, and led a race-high 119 laps. 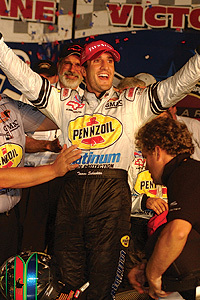 He passed Tony Kanaan on Lap 191 to regain the lead for the final time, and held off Hornish until the thrilling finish. Scheckter gave Panther its first victory since the California race in 2003, and he became the all-time lap leader at TMS. The win also shot Scheckter up to 9th in the chase for the 2005 IndyCar Series Championship. During the last final surge to victory Saturday night, Scheckter got some help from Hornish's No. 6 car, and Sam helped push his former No. 4 through the final passes and into the lead. Then, when it came down to who was going to win the race, all Hornish could do was hang on to second place, because on that night, nobody in the field was going to pass Tomas Scheckter. "I told (Panther) about 15 laps into the race, 'Whatever it takes, I'll be with you all night long. I'll push you by anybody,'" Hornish said. "I knew they had the fastest car out there." From the Panther side, the last 10 laps would have been a little more relaxed if the team had known Hornish wasn't going to sneak ahead at the line like he did so many times behind the wheel of the No. 4. "I'll be first to admit," Panther co-owner Doug Boles said after. "Watching Sam behind us the last 10 laps, I know it made everybody nervous because we know how good Sam is at this place and he's done it for us so many times." If you remember, when Hornish left Panther in 2003 and the team hired Scheckter, the message from owner John Barnes was very simple: "We decided that if we had to go wheel-to-wheel against Sam Hornish at the end of the race, the best guy to have on our team is Tomas Scheckter." And, Saturday night, as Tomas flew past the checkered flag just 0.0534 seconds ahead of the former Panther captain - Barnes' words made perfect sense. "I got a lot of horsepower from Chevrolet tonight," Scheckter said in the post-race press conference. "But I got some extra from Sam." In the closing laps of the race with Tomas behind Scott Sharp, Tony Kanaan and Hornish, Scheckter knew where he needed to be. "I was trying high a little bit and really wasn't making any ground," Tomas explained. "I dove to the inside and managed to get by Sam. Then Sam helped me by Scott, and then he helped me by Tony. It just made my life a little easier." Each time Tomas made one of his final passes he keyed up his radio and said politely, "Thanks, Sam." Tomas Enge qualified second for the race, and was the fastest driver during the final day of practice yesterday. However, while running strong during Saturday's race and electrical failure forced him to pull into the pits to make changes. The RockStar team fell several laps down and despite running as quick as the leaders, Enge had to settle on a 19th-place finish. Enge was once again the top rookie qualifier, which is the fourth time this season. Enge also equaled the best start for a rookie, tying Danica Patrick's effort at Japan earlier this year. Saturday was his third start from inside the Top 5, and the 28-year-old has started inside the Top Ten at every race he has qualified for this season. Panther Racing has a total of five victories at Texas Motor Speedway - two each by Scott Goodyear (Texas I, 1999 & Texas II, 2000); Sam Hornish, Jr. (Texas II, 2001 & Texas II, 2002) and tonight's victory by Scheckter. "Now we want to ride this wave and start winning these races more often," Scheckter said. "Chevy has proven they're the engine to beat, and I'm so proud of those guys for what they've done for us this season."